Is it a new feature or an upgrade? This is a new feature. SkillsServe is now fully compatible with Safari on the latest version of Apple iOS on the iPad. How it works… SkillsServe navigation and user interfaces will now work on the iPad. SkillsServe will automatically detect the type of platform being used and adapt accordingly. DF and e-briefing content, plus mobile compatible eLearning are fully compatible with the Apple iOS. Why is this beneficial? It's now possible to access SkillsServe on the move – for example accessing compatible eLearning, taking assessments or running reports in meetings. Note – a Wi-Fi or 3G/4G connection is required. Note – not all content is tablet compatible Please contact your Account Manager for information on courses that are compatible with the iPad. Default or Configurable? iPad compatibility is default on all SkillsServe v4 sites. Is it a new feature or an upgrade? The integrated Help forum is a brand new feature that can be configured to work with all v4 sites.Its purpose is to enhance the customer service experience and enable clients to get answers to queries without having to contact the Help Desk. Doing so will open up a window that gives administrators these options to choose from clearly and concisely. Any feedback raised by clients will be regularly reviewed and responded to by the Unicorn team. Why is this beneficial? 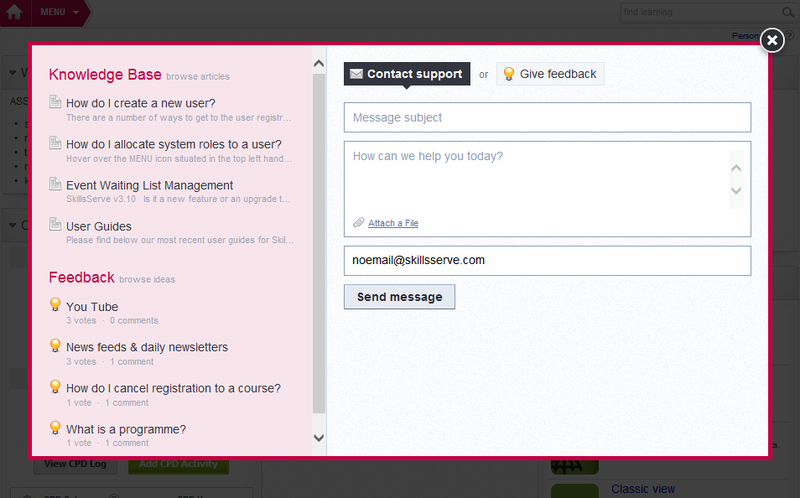 This feature provides a quick and easy way for all client administrators to raise a ticket with our Support team, provide feedback and get guidance on the SkillsServe platform without having to pick up the phone/wait for the answer to an email. Default or Configurable? The Help Integration feature is configurable on all v4+ sites. An upgrade has been made to SkillsServe’s reporting system. Improvements include relative date filtering, new reporting fields, performance improvements and the ability to create bespoke reports more easily. How it works… The filtering section of reports has been extended to include relative dates.This means reports can be filtered to display data within days, weeks, months or years of the report running.For example, you can run a report that identifies which users have logged in to the system in the past week.This option is available on all date fields on the platform. A new custom data source has been created on SkillsServe that will allow our development team to create tailor made reports for clients.This is ideal for clients who need to report on data in instances where the standard data sources do not accommodate their needs. This new feature can be used to enable outbound data feeds to the client’s systems (e.g. HR feed, other tracking systems). Why is this beneficial? You can now create reports such as “who has completed a course in the last seven days” or “who hasn't accessed the platform for over a month” and have this information emailed directly to you without having to log in and change date filters. The new report fields provide additional useful information for those that need it. Finally the new custom data source provides the Unicorn team with the ability to meet more complex bespoke reporting and analytics requirements that go beyond the existing reporting wizard. Default or Configurable? These improvements come as standard on all SkillsServe v4+ platforms.